Dark Tonic's latest iOS game is ad-free... if you're good enough. Mobile game developers face a unique problem: How does one provide free, high-quality content, and still get paid for their work? Third-party advertisements are a common answer, but many gamers revile ads for being obtrusive or annoying. It's a difficult balancing act, so developer Dark Tonic has decided on an outside-the-box solution. Its latest iOS game, Attack of the Wall Street Titan, is ad-supported but gives everyone the chance to switch them off permanently. All you need to do is prove your gaming skills, and disabled banner ads literally become your in-game reward. "This is an ideal way to deliver quality game experiences in a way that can support developers through in-game ads, while letting the players that enjoy the game the most earn a fully free copy," says Dark Tonic Creative Director Eric Boosman. "It's so win-win. Casual players get a truly great free game, with ad support, regular players that develop a moderate skill level disable the ads forever, and we can sleep at night knowing that we're supporting ourselves without having to ruin the game experience to do it. All developers of ad supported games should be doing this." Attack of the Wall Street Titan places you in control of an evil CEO's giant robot, reprogrammed to protect the 99%%. Each arcade-style level lets you wreak havoc on banks and financial institutions to redistribute wealth, and provides a three-star ranking upon completion. 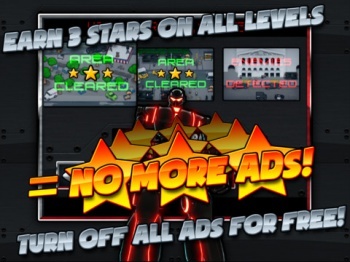 Players who obtain three stars on each level will instantly switch off advertisements, making all future playthroughs 100% banner-free. I doubt Attack of the Wall Street Titan will be the one game that revolutionizes mobile advertising, but it's encouraging to see someone experiment with the model. Players can earn the right to disable ads without spending money, Dark Tonic gets paid for its work, and everybody goes home happy. If we're lucky, developers will find additional creative ways to keep fans happy and their wallets full. Who knows, perhaps one day we'll see games that treat advertisements as enemy NPCs, wiping them away with literal button presses.